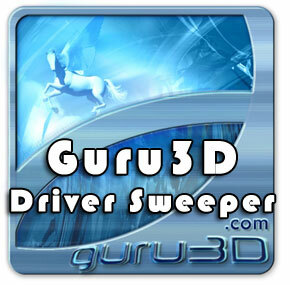 On this page you can download Guru3D - Driver Sweeper (Setup). 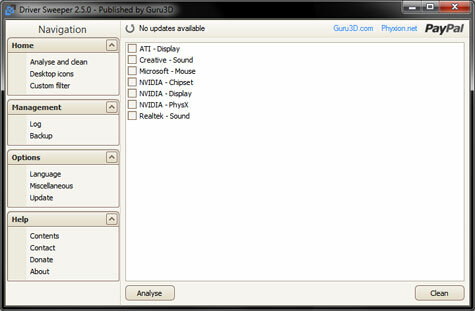 Attention - Guru3D Driver Sweeper has been discontinued as such you will not find any download links here any longer. The Guru3D - Driver Sweeper is fully tested on Windows 2000, XP, Vista and Windows & 7 RC. Both 32-bit and 64-bit versions are supported. Official Guru3D - Driver Sweeper homepage click here. Official Guru3D - Driver Sweeper forums click here. Added ASUS - Sound cleaning. Added process stopping to prevent several entries being locked. This includes several OS processes and third party software (RivaTuner, Afterburner, etc). Added service stopping and cleaning. Improved Creative - Sound cleaning. Thanks to DyP and MrBozack. Some registry entries not showing up in the analyse list. Some file and directory entries not marked as cleaned. Additional cleaning methods not working when files are protected by OS. Unhandled Exception crash occurred while trying to find some directories. Note: If you have problems downloading Guru3D - Driver Sweeper (Setup), please try to stop using your download manager and avoid right clicking on files. Also, check your firewall settings, because some mirrors may require that you do not block the HTTP referrers.